I've posted this in a thread over on PistonHeads as the seat height issue was mentioned in athread comparing the 1M with the E46 M3 CSL and the Z4M. As this forum is more model specific, I thought I'd post my findings on here too. Please note the seat height/adjustment issue does seem to be a very personal thing. From my perspective it pretty much ruined the experience of driving what is otherwise a fantastic car. It tainted the experience to such a degree I seriously contemplated selling the car. Not only did it compromise my enjoyment of the car, it made driving it physically painful too. 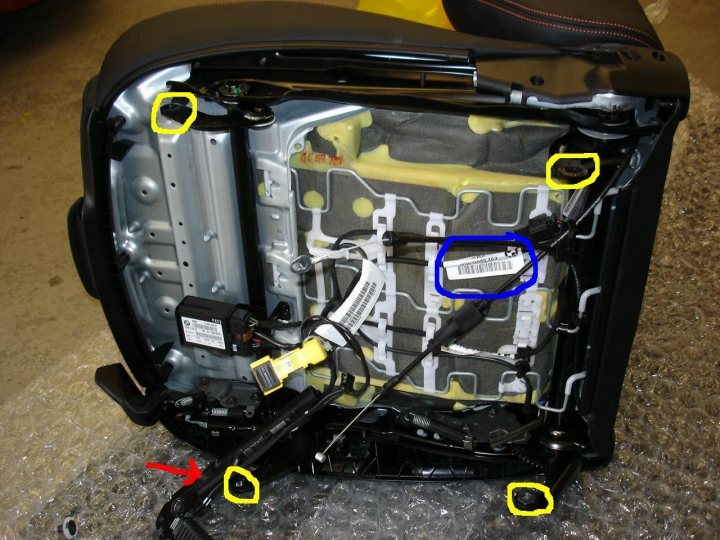 The seats are taken straight from the 3 series coupe, witness the label with "E92 Sport" highlighted in blue. Note that none of the modifications made are irreversible, be they to the the seat, the seat base or the cars floorpan. As this was a safety critical component (as was the mounting of the seat itself) it took a long time to design and fabricate a neat and strong solution to enable the fitment of the pretensioner and the stalk to the Sparco side mounts. 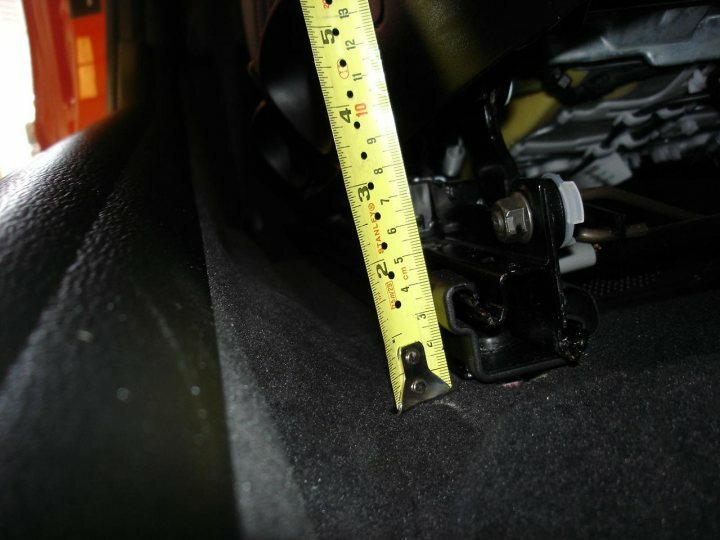 They were chosen after careful measurement and for the fact that the only section needed was the "rail" to mount to the floor, no "side mount" sections were needed as the intention was to lower the seat to the absolute maximum. These two images show the finished install and also indicate that the seat is mounted as low as is physically possible in the car. The results make for a far superior driving position and in turn make you feel much more "at one" with the car. Whilst buying the seat mounting brackets from DT, I checked out the Recaro Sportster CS they had in the showroom. Whilst it's a superb seat, I'm not convinced it's actually mounted any lower than the OE seats in the 1M, if anything I suspect they may be higher. From my admittedly limited research, it would appear that Recaro don't/won't supply 1 series Sportster CS seat mounting brackets/adaptors. Seemingly BMW have an exclusive deal to supply them. My BMW dealer said the brackets were not available separately without the seats either. . . . . . If I decide to keep the car, I will, as mentioned previously, most likely invest in a pair of Recaro Pole Positions and have them trimmed in black leather and alcantara with orange stitching. Hope this helps those of you NOT sitting comfortably in your 1Ms ! Last edited by Dirk Van Driver; 03-03-2013 at 04:05 PM. oh btw...would it be considered "legal" afterwards? nevermind...UK is probably a little different than the US (we have some harsh restrictions for what is considered "legal"). 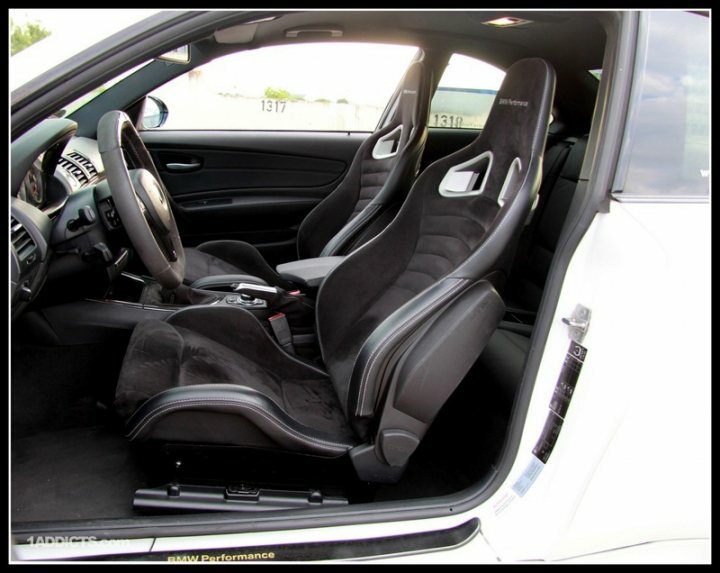 Why wouldn't you just but the BMW Performance seats? So you put a 3er seat in your 1M ??? Firstly as I mentioned, the Performance seats don't appear to be mounted any lower than the factory fit OE seats, they most likely give more support during cornering, but they don't address the primary issue I was experiencing, that being the seat height even in its lowest position. In addition to which the Performance seats cost IRO £3500 in the UK. No USA dealer would touch this request for liability reasons ...I no i tried to have my seat re-positioned in one of my Honda's and they would not even consider it....and the service manager is a friend of mine...I have no issue with the height of my 135i seat at all as i do not like to sit so low anyway as it disrupts my visability as well as blocking what gear i am in when i am in manual mode paddle shifting....But i would have to agree with DAckel...BMW Performance Recar's would of been my choice. You might just be my absolute hero! I would absolutely kill for 1 or 2 inches of additional headroom for helmet clearance! This seems to be the ticket!! 1. I'm not sure I understand what you're saying about the seat belt buckle mounting and I can't tell from the pictures. Did you have to do any custom fab work to get the buckle mounted? 2. Other than the Sparco seat mounts, do I need anything else? 3. Do the Sparco mounts have to be modified for this to work? 4. Why do you think this doesn't look factory? I have a 135i, but I assume the seat mounts are essentially the same. Did I mention this is exciting?! Hi IZAGLO, whilst the Performance seats look great and match the interior of the 1M perfectly, I don't think they address the problem of the seat height. My install was not carried out for looks or to impress others, it was done solely to improve the driving position. It did so and improves how the car drives/feels massively. I don't use my car for cruising or posing, so it gets driven hard. Take a look at any competition car and you'll find it's driver sitting lower not higher. This is done partially to lower the centre of gravity, but also it tends to align the drivers natural roll center with the cars. He in2str, I think you'll be able to utilise the Schnell seat belt mounting bracket, the seat belt stalk and pretensioner requires two mounting points, primarily to stop the pretensioner device rotating in the event of an accident. Get a good fabrication shop to make this up for you if you're not confident of doing it yourself as this really is a safety critical issue, hence we spent a lot of time ensuring the part we fabricated was as strong as (and if I'm honest I suspect stronger) than the original factory part. Just for the record, you can get the Performance Seats with heating. Plus, I guess it was Jezzer in his thread about the Performance Seat install warning everyone about installing them in "their lowest position" so maybe they are a bit lower than the standart seats? My car for instance is without power seat option (standart seats) and the seats are around 3 cm. lower than power seats but still not particularly low, I admit that, could be an issue for a taller guy. Sorry you had to go through all that. The seat height issue has been around for some time. I tried explaining to everyone that the manual seats are over an inch lower. Mine has the manual seats and no issues. Most people ordered their 1Ms loaded with power seats and are not aware that the manual seats have more height travel. So another option is to use factory 1M manual seats which would not cause a warranty or safety issue. Thanks for the write up too. Thanks for your comments, I got "caught out" with the electric seat additional height in a E46 330 Ci some years ago. Once again I couldn't get them low enough to make them comfortable. A salesman pointed out to me that all the motors, gears etc made the seat higher. As proof he sat me in a car without electric memory seats. Sure enough, I could get comfortable without a problem. Interesting, my BMW dealer told me that heating elements weren't available with the Recaro Performance seats. I questioned him as I was sure I'd read (on here ?) that they were. That seat is mounted veeeeery high ! Not sure how much the "lower setting" drops them by (Jezzer ?) but I'm not convinced they'll be anything like as low as the seat in my car still, but I'm willing to be corrected. I don't understand with OP mode will seats stay 100% functional? All functions 100% except fore and aft movement. Ive sat in the BMW perf seats and they are definitely lower than my sport seats. That being said they unfortunately arent an option for most of us. This is a great write-up man. Thanks for putting all the work into it. Sorry you had to go through all that. The seat height issue has been around for some time. I tried explaining to everyone that the manual seats are over an inch lower. Mine has the manual seats and no issues. This is in a 135i though. 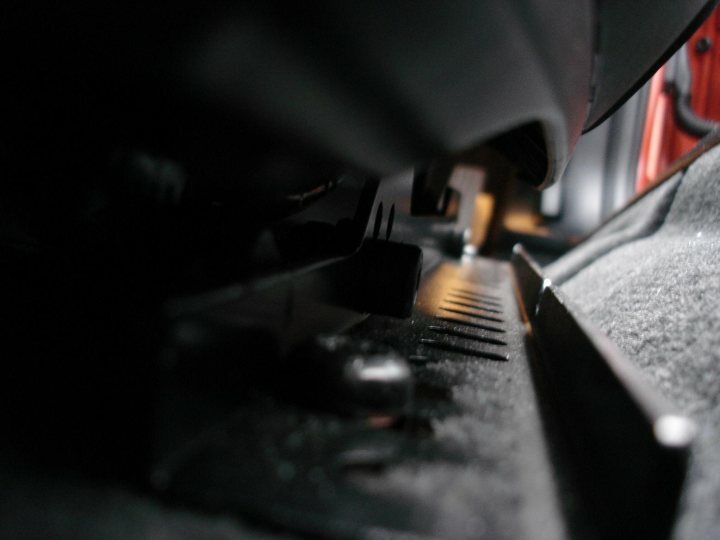 Since the 1M doesn't have a sunroof, you gain probably at least 3-4cm of head room on top. which you will have to have when it does come time for it's MOT in a few yrs time, so I assume its reversible? Obviously quoting out of context, but I'm not gonna lie - I lol'd! The Performance seats on the highest setting sit higher than the manual OEM seats. 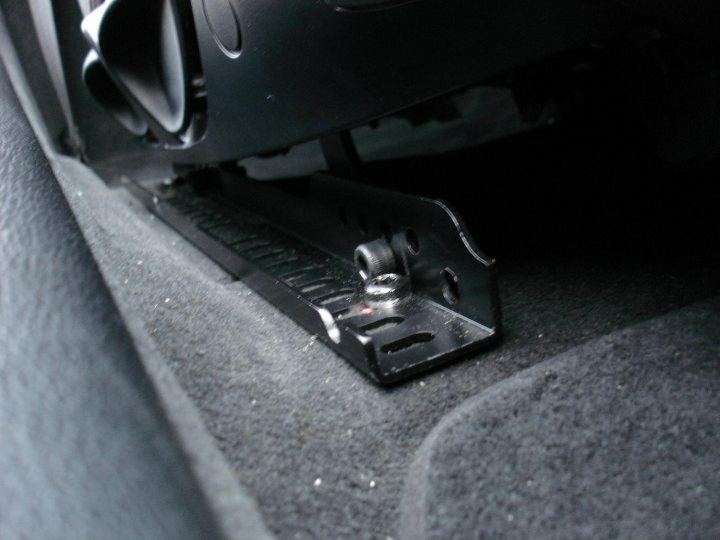 The Performance seats can be lowered 20mm by positioning the bolts in the lower bolt holes. I don't think they would be any lower than the OEM seats though. I haven't put the Performance seats lower as I find the position comfortable and don't want to change and get backache again after every 30 mile plus journey.